Help elect Mary by getting involved. Would you like to hand out palm cards? How about making phone calls? Or would you like to get a lawn sign for your front yard? Please send an email to mary@starrettforcommissioner.com. 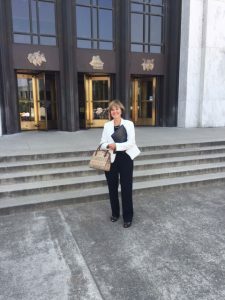 At the Capital in Salem working with legislators to address local issues. Oregon law allows for individuals to deduct up to $50 per year, and couples to deduct up to $100 per year for political contributions.